During last month's I receive emails asking me about the IQ+ LO stability. Other ones ask me if is possible to "lock" the LO with a 10MHz external reference to improve stability. After several test I conclude the IQ+ LO is stable enough to work unlock with any external reference oscillator. You will lock your LO with a external reference if your LO drift too much and this is not the case for the IQ+ LO. In the next figure you can see 100Hz of BW and two carriers, these carriers correspond to two different signal generators, sigA is in 144.120.00 MHz and sigB is in 144.120.08 MHz. Both generators are lock with same 10MHz external reference oscillators. In the left side you can see the time stamp; the image represent a waterfall with 25min displayed. You can see how stables the signals are. The variation, if exist, is less than 2Hz during the 25min test. 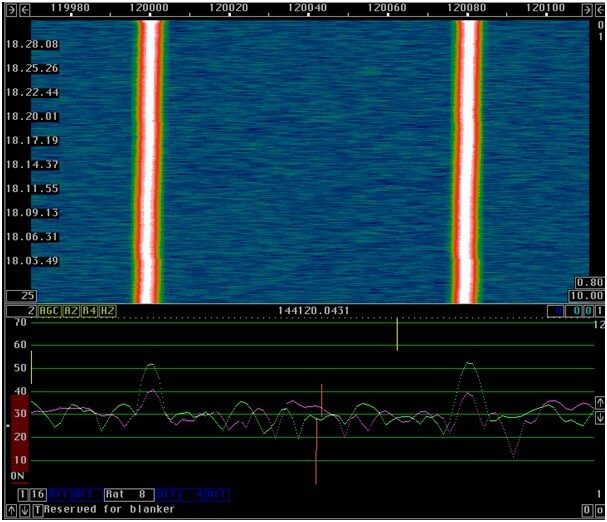 The test was not long enough but give a fast view how stable is the Si570BBB in short terms. My conclusion is the IQ+ LO is stable enough and don't need any external reference oscillator to improve stability. This benefit is translated in lower cost and more simple system with less dependable sub-systems from external devices.